For over a decade prints of Maori artist Douglas Ferris' exquisite pencil sketches have sold steadily to collectors of Maori art throughout NZ and around the world. Born in Hastings Ferris is from the iwi Ngati Porou. 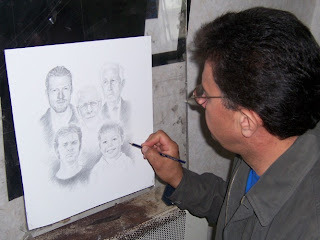 Douglas is shown here creating one of his portraits in his studio. We asked Douglas to tell us a bit more about his artistic background and what sparked his interest in Maori portraits in particular. Ferris told us that he gained his Bachelor's degree in Fine Arts with Honours from Brigham Young University in Hawaii, his wife Charlotte added that "he received the prestigious Top Artist Student Award in 1995 [his last year of study]. Charlotte also told us that Douglas' "informal training began as soon as he was able to hold a pencil and paintbrush. He has drawn and painted ever since [and] has been doing portraits since primary school". So why did he focus on portraits of Maori? Ferris said he had admired "the special spirit that our Maori people innately possess" and that he particularly "enjoyed capturing this human spirit in representational art". Capturing the pride of "our people" in his portraiture is paramount to Douglas. Ferris says he doesn't take it to heart when people criticise him for selling portraits of Maori (see our previous post on the controversy about prints of Maori portraits by Goldie & Lindaur), he gets "thousands of thanks for making it possible for relations to have a picture of their relation". Ferris' classical art education background sees him looking to masters of representational art such as Carravagio, Rembrandt and Velazquez for inspiration rather than to other contemporary NZ artists and he describes the process of creating his Maori portraits in characteristically straight forward terms "I look, I see, I create". All of Douglas' prints are held in stock at New Zealand Fine Prints - at just $29.95 each his studies are some of the most popular prints in the Maori art collection with customers often buying several prints at a time to frame as a series. Hi Douglas, I would like to use one of your images for a non-profit project. Do you have an email address or phone number I can contact you on? We replied via your Facebook message. Thanks for asking.